Keokuk Falls wasn’t actually in Lincoln County, but its close proximity makes some of the town’s notorious history worth remembering and sharing. Located only a few miles southeast of Prague and the Lincoln County line, Keokuk Falls stood near the bed of the North Canadian River in the “panhandle” of Pottawatomie County. It was named for Sac and Fox Chief Moses Keokuk on whose original tribal allotment land the town site was established soon after the land run of 1891. Keokuk lived in a log cabin west of the town site and his great-grandfather was the first person buried in the Keokuk Falls cemetery. Town founder, Henry C. Jones, also a Sac and Fox, traded for Keokuk’s land, became its first postmaster and owned a store there. The place had been a trading point since 1823 when keelboat captains first came up the river to trade trinkets for furs with early day Indians living in the area. A legend says author Washington Irving stooped there in 1832 and carved his name and date on a rock nearby. In 1892 a Mr. Beatty opened the first saloon and was doing a brisk business. The Black Dog was a thriving enterprise, thanks largely to its trade with the Seminoles across the North Canadian River. The population never reached more than three hundred, and according to early records, the number of the town's saloons grew disproportionately to the number of residents, reaching as many as sixty-two saloons by 1900. Keokuk Falls was devastated and scores injured and killed in a tornado in 1895, and “thousands of dollars worth of property was demolished,” according to the New York Times. Due to its location on the boundary between Oklahoma and Indian Territories, Keokuk Falls became a kind of “no man’s land” and therefore a haven for liquor, prostitution and gambling. Well known gangsters often stopped to partake of its vices. At one time there were so many saloons in the town that a stage coach drivers told passengers they could “stop 20 minutes and see a man get killed.” In 1904 a bitter rivalry broke out between saloon keepers. The Black Dog attracted a physician, Dr. N. Stutsman, an understudy to the famous Doc Holliday. He tried to buy out the Black Dog but Beatty refused, so he opened a joint of his own, the Red Front Saloon. It was an apt name, for both the saloons were painted red by the blood that soon flowed. The killings that resulted eventually forced four saloons to close. One day an auctioneer rode an ostrich into Keokuk Falls as a marketing tool, and once pigs ran wild after they drank mash a distiller poured onto its main street. Hiram Thorpe, the father of Olympian Jim Thorpe, lived near Keokuk Falls and often “boozed it up” at one of the saloons, said the late Grace Thorpe, Jim’s daughter. She said her father often ran from the Sac and Fox School, south of Stroud, to his father’s home. Some say the lawlessness was because the town never had a town marshall or policeman and others claim it was because there were no churches in Keokuk Falls. A newspaper reported a Baptist preacher held services in the Red Diamond Saloon and baptisms in the river in summer. References to Keokuk Falls’ crime ridden history are many, but it also had a “normal” side with hotels, general and drug stores, saw mills, cotton gins, ten doctors and a coffin factory. Early day settlers regularly traveled there to have their wheat ground into flour since it had the only grist mill for miles around. 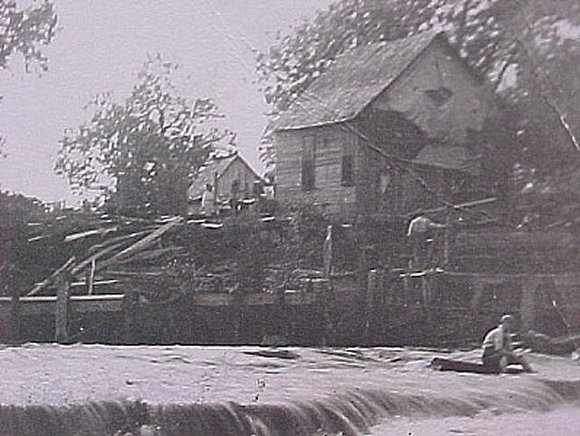 The mill was run by a big water wheel in the river and the Keokuk milling Company produced four brands of flour, including one called Keokuk Chief. The falls, for which the town was named, beckoned campers who came to cool off in summer months. They swam and played in the waterfalls sometimes eight feet high after spring rains, danced on a wooden dance floor, and enjoyed carnival rides near the picnic grounds. Oklahoma statehood figured into Keokuk Falls’ colorful history due to its prime business--illegal whiskey making and selling. Sources say every man, woman, and child in the town celebrated by consuming many gallons of whiskey the day before statehood on November 15, 1907. Statehood, which brought prohibition to the entire state, meant the end of Keokuk Falls’ glory days, and it was slowly abandoned. A remnant of Keokuk Falls survived until the big flood of 1923 changed the river’s course and filled in the falls with sand and silt. The town had a bit of a revival in the 1930’s when Carter Oil Company bought the vacant town and struck oil with Keokuk Number One. The company began a media blitz and said the strike would bring a big oil boom to the surrounding area. Soon after the oil strike federal government engineers arrived to look at the possibility of building a hydroelectric plant on the river. Nothing came of the oil plant or the water plant and Keokuk Falls became a true ghost town with nothing left to tell but its wild stories. Today, only the Keokuk Falls Cemetery exists to show there ever was a town. 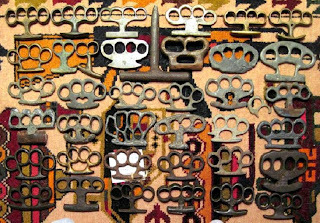 What also exists is a set of hand-made lead knuckles, dug up in the remains of Keokuk Falls by a treasure hunter in the 1960s, purchased by this writer at a flea market in 1986 and evidence of its notorious past. My interest in the antique was for its historical background since my father, who worked in the early day Oklahoma oilfields, had told me about Keokuk Falls’ wild and wooly history. 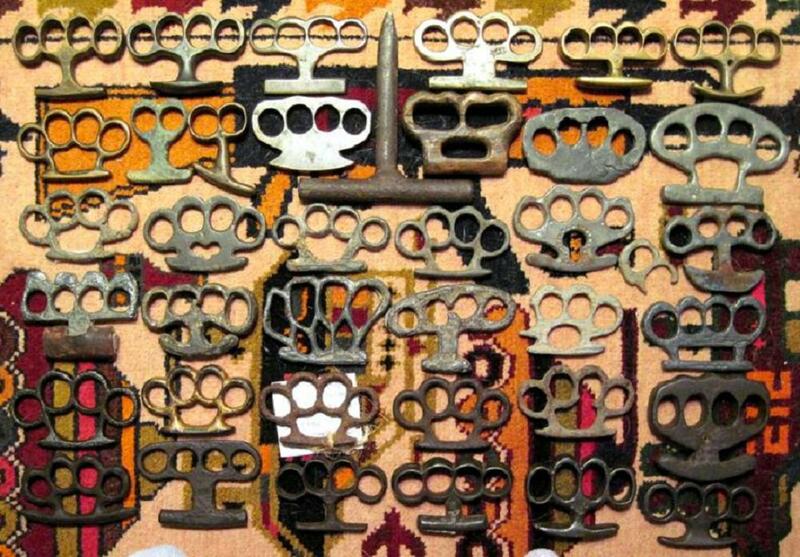 Imagine who poured the hot lead into a hold on a board or used the finished weapon to deliver a brutal blow to a rival in a gang fight on main street. And wonder why the story of Keokuk Falls hasn’t been made into a movie. Perhaps it’s because almost everything about the town was just too real to really be believed! 100 Oklahoma Outlaws, Gangsters, and Lawmen, 1839-1939, by Dan Anderson and Laurence Yadon. i was born very near there in 1933. My great grandparents lived there and my grandparents met there. We have a drawing of one of their homes done by my Aunt who was also raised there and lived nearby. My great grandmother was born there too. I have some pictures if anyone is interested. Would you considering posting these on line or sending a copy by email? Am very interest in how this town was laid out, its proximity to the river, and the absence of indication from the present road and supposed location of anything in the area indicated the history of a river bank. My great grandfather owned a hotel with a saloon in it in Keokuk Falls. Sadly, I never learned the name of his place. I live within 5 miles of the location and as a child I remember exploring the old buildings which were still standing in the late 1950s but are now gone. I also grew up close to Keokuk Falls and remember my Grandpa Shivers telling many stories of his childhood adventures in the town. Born in 1951 - I am glad I got to make a few trips thru what we called "the ghost town" on some Sunday drives. My Dad loved to drive thru the old town and I was old enough to remember the old buildings and some of the storeies he told about visiting the stores in Keokuk as little boy. Do you know if the town was on the bank of the river as it was? I'm from Prague ok. My husband found a horseshoe by a building in Keokuk falls. Can't remember what year, but we married in 1961 and hangs still today over our shed door in Broken Arrow ok.
Do you how far away the river and the falls were originally? My grandmother was born there around 1890. They say she had a Indian card...would like to find info.